When I was a small child, I was a very picky eater. I refused to eat most vegetables, cold cheese, cold cuts, condiments, anything that smelled even faintly of vinegar, and anything saucy–other than chocolate sauce or spaghetti sauce. Perhaps the category most reviled by my young palate was soup. I found the whole wan and watery business suspicious (who knew what might be lurking at the bottom of the bowl?) and texturally unacceptable. But it turned out I was a few years off the mark. I am still far from a hundred, but my tastes have evolved to the point where I love most vegetables and will really eat just about anything. It turns out I even like soup. I find pleasure in its simple everydayness. As a category, soup isn’t flashy or fancy, but it’s warming and usually nourishing and it rarely feels like too much. Lentil soups are particularly homely. This one isn’t going to win any prizes in the looks department. But this is a case where appearances are misleading. 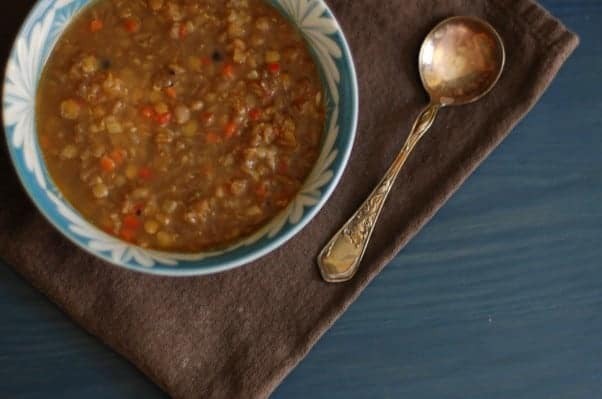 It looks like a simple lentil soup, but it gets some serious heat from the black peppercorns and some sweetness from the sauteed red bell pepper and a note of exotic spice from the cumin seeds. This comes from the late great Judy Rodgers’s Zuni Cafe Cookbook. It’s among my favorite cookbooks, one I trust implicitly. 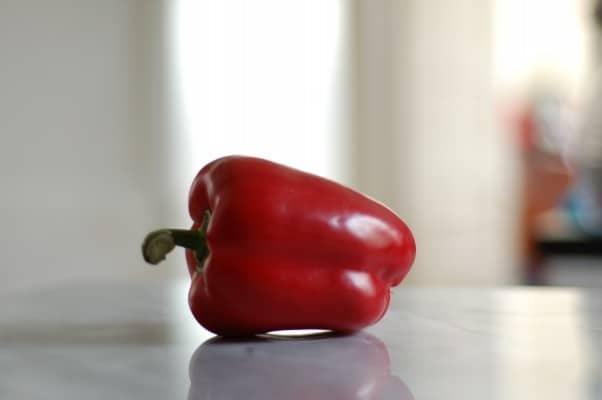 This is a recipe that’s nice to have in your back pocket when you have lentils in the pantry and all you need from the grocery store are the easily findable red bell pepper and the familiar onion-celery-carrot crew that comprise your average mirepoix. It’s stored away in my “quick and easy and satisfying” mental file of weeknight options. It’s sturdy and reliable. Looking for more soup inspiration? Try this carrot ginger soup, this hot and sour soup, this roasted cauliflower soup, or this savoy cabbage gratin that isn’t quite a soup but is a wondrous stewy thing. This is an unpretentious weeknight kind of soup. The amount of black peppercorns is right, but don’t be alarmed. They give the soup a nice background heat. But because of them, this isn’t the kind of soup that you want to leave simmering on the stove for hours (I did that once, and the black pepper flavor took over). 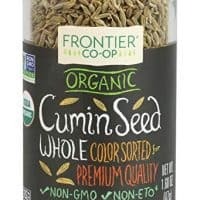 This is vegan if you make it with water or vegetable stock and gluten free if the stock you use is certified gluten free (or you could always use water). 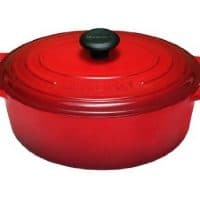 Heat a tablespoon of olive oil in a large saucepan over medium heat. 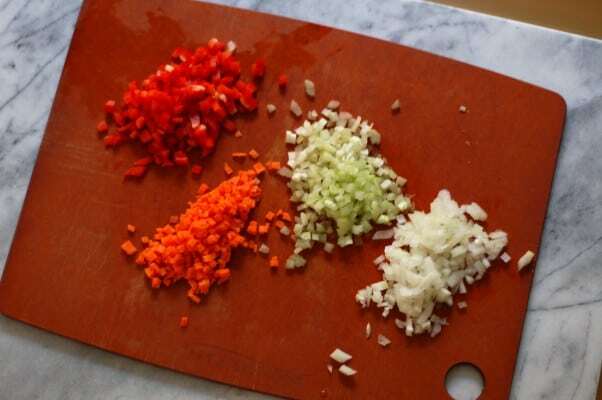 Add the bell pepper and saute for about 5 minutes or until the pepper begins to color. The oil will turn a deep orange shade. 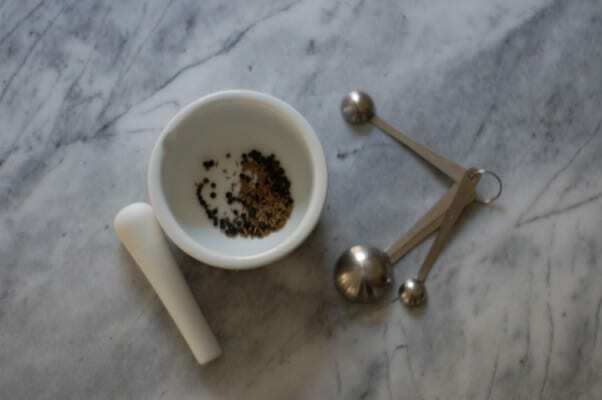 Using a mortar and pestle, bash up the peppercorns and cumin seeds and add them to the saucepan and cook for a minute, until fragrant. 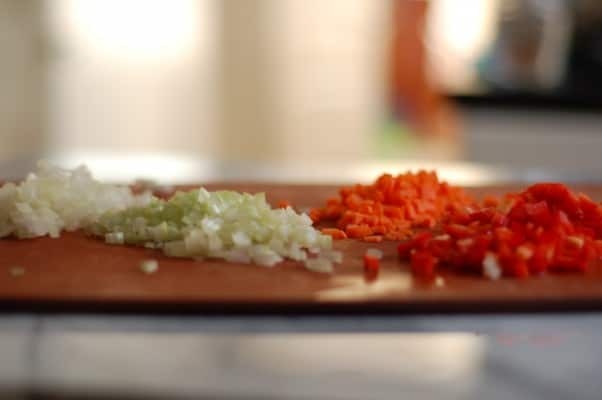 Add another two tablespoons of olive oil, carrots, celery, onion, garlic, bay leaf and parsley and saute for about two minutes, until they begin to soften. Add the lentils and 3 cups of stock or water and bring to a simmer (if using water, you’ll want to add a pinch of salt here). 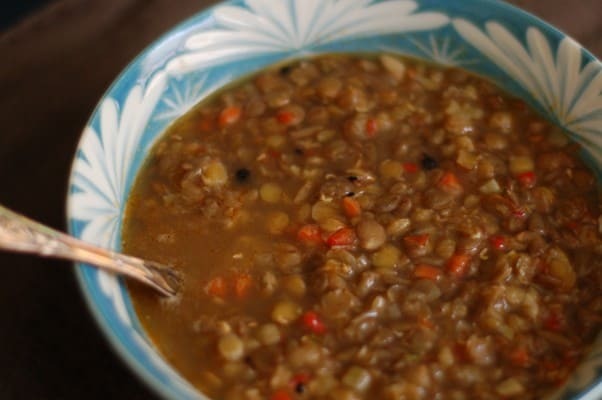 Reduce heat to low and cook the lentils at a low simmer, uncovered, until the lentils are tender, about 20 minutes. Using a potato masher, roughly crush some of the lentils to give the soup more body (you could also use a stick blender to partially puree it). Add the remaining cup of stock or water and bring to a simmer. Taste to see if needs more salt. Serve. Made this today (it felt appropriate, since we’re expecting snow tonight). I sprinkled some crumbled feta into my bowl, which was super delicious. That’s a great idea for a topping. I’m glad you liked it. This looks delicious! I’ve been craving lentils for some time now and nobody in my household will eat them but I can make this for myself. Can’t wait to try it!